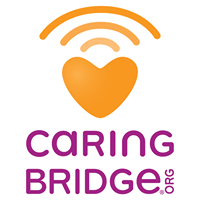 CaringBridge is a website that allows anyone facing a medical crisis to create their own private website, connecting them to friends and family during a difficult time. Even if you've never done more than surf the web, you can create a website with CaringBridge. They have an easy tutorial that walks you through the process, and literally within minutes you can have your own private, personal website complete with journal, photos, guestbook and more. Actually, Caring Bridge is supported by generous donors. But is completely free to those who are going through their own health crisis. It is an absolutely wonderful tool to use if you or a loved one is on your own cancer journey. We decided to create a Caring Bridge website for mom within weeks of her diagnosis. She was receiving so many phone calls, texts and emails those first few weeks that she was becoming emotionally spent. Now, don't get me wrong. The phone calls, emails and support were good, but it was hard telling the same, grisly story over and over, and receiving so many, many condolences. After one particulary, mournful phone call from a "friend," mom said she'd had enough and wasn't going to talk to anyone else that assumed she already had one foot in the grave. We knew we had to intervene and find a way to facilitate the communication between mom and her loved ones. Enter CaringBridge! It has truly been a remarkable experience using this website. Mom's emotional stress level has gone from frazzled at dealing with the many well-wishers to relieved and grateful for their support. I offered to write the journal updates, usually once or twice a week, and everyone in the family takes pictures of family events, get-togethers, weddings, birthdays and posts them to the website. Anything with mom in the middle! I think it helps family and friends to see her getting on with, and enjoying, life as much as possible. And the updates allow friends to keep posted on mom's treatments, her well-being, her needs and her victories. That helps everyone better know when to call and gives greater understanding when she's too weak to have visitors or just needs prayers. And Mom's favorite part? The guestbook. This is where friends and family, neighbors and co-workers can add their own messages to mom. These notes of encouragement, hope, and love are like an instant hug for mom. Even on her lowest days, we could find her curled up with her iPad on the website, smiling and reading the latest comments. Now, that's some of the best medicine around! I would love to share mom's website here, but because it is private, and because many of the guestbook comments are personal, I feel it is best to leave it private. However, please click on the link above to learn more about CaringBridge. There is a demo website you can look through and also a tutorial video to help in creating your very own, free, health journey website. Coping with cancer is difficult in so many ways. CaringBridge gives you a tool to keep connected to the loved ones who are standing in the gap for you. It is truly a Bridge of Caring.